Fans invited off a street in Tokyo's Harajuku area to meet Pino pose with the popular robot. Pino, short for Pinocchio (after the fabled wooden puppet that becomes a human boy), is a full-bodied, child-sized, humanoid robot. Even before it demonstrates the ability of a wide range of bipedal movements it already has a national following in Japan after the release of a music video called "Can You Keep a Secret" in which the robot stars alongside one of Japan's most popular recording artists, Hikaru Utada. It has elevated Tatsuya Matsui, the artist who created the robot design, to celebrity status and provoked murmurs of dissent by some in the robotics community who see the robot as a commercial entity rather than a serious research project. Interestingly, the robot project is part of a large ERATO grant from the Japan Science and Technology Corporation, a branch of the Science and Technology Agency of the Japanese government. 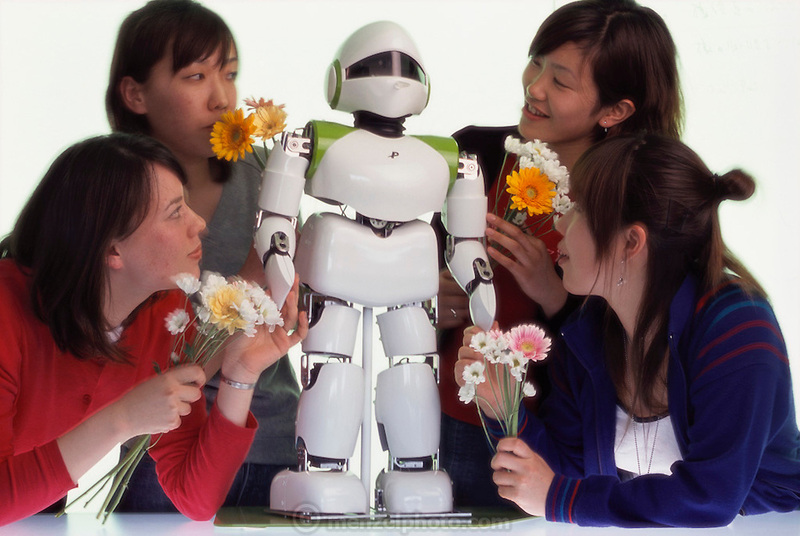 Project creator Hiraoki Kitano believes that the aesthetics of a robot are important in order for it to be accepted by humans into their living space. At the Kitano Symbiotic Systems, Tokyo, Japan.